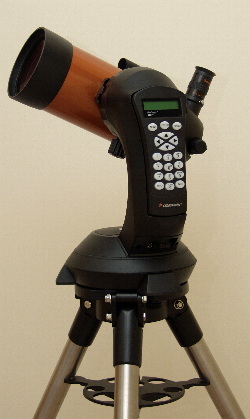 I bought the NexStar 4SE as a small grab and go scope to supplement my Sky-Watcher 200. The Sky-Watcher is a great telescope but its physical weight and bulk when mated with its mount and accessory cases was proving too cumbersome and I found myself missing out on clear nights when I had limited time to spend. Recently I had transported the SW 200 to a fair few dark sky sites only to find that during set-up or shortly after the weather turned nasty. The time investment in moving such a large telescope and setting it up was quite large and I found my enthusiasm for using it starting to wane. I live in a smallish top floor flat in a heavily light polluted area. Technically a large Newtonian is the wrong kind of scope for that environment but I happen to like Newtonians and accepted its usage may be quite low when I bought it. In a nutshell I wanted a small, lightweight scope that required minimum set-up times to take advantage of the changeable weather and which could be put out on a site very fast for times when I cant devote a whole evening to stargazing. I looked around to see what might be a good choice to fill the requirement. Quite a few telescopes could meet the requirements and I considered a small APO refractor and a small Newtonian. 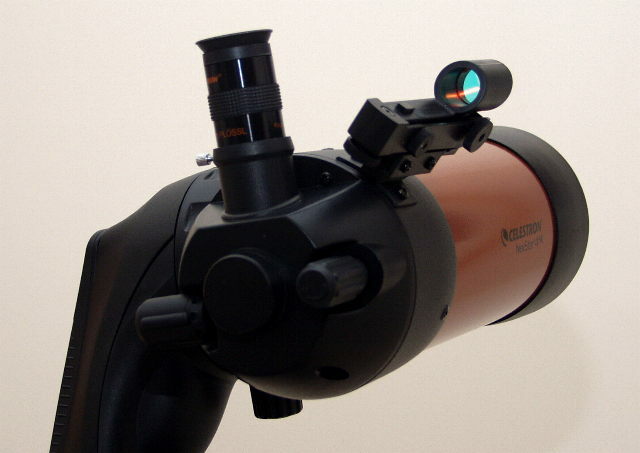 The problem was with the budget I wanted to spend a small APO would mean a very basic mount and even a small Newtonian would take up too much storage space in the flat. Much as I like Newtonian Reflectors I really wanted a telescope that would require minimum maintenance thus ensuring it would be ready to go at a moments notice and would be hardy enough not to require additional cases and baggage. The choice in the end came down to a small Maksutov on the basis of no collimation required, relatively powerful optics for its size, small packaging requiring a simpler mount. The NexStar 4SE fitted the bill rather well as its small enough not to strain a simple Alt-Az GoTo mount. I did briefly toy with the idea of a larger SCT such as the NexStar 6SE but it would have stretched the budget and also been larger than I really wanted. To follow the desire for bigger aperture would have ended up with me owning a Celestron CPC 800 and, nice as that scope undoubtedly is, it would present the same transport issues as I was facing with the Sky-Watcher 200. Having decided on the NexStar after a longish conversation with the estimable Steve at First Light Optics I paid the money and waited the arrival of the baby sized telescope. I also ordered a dew shield as Maksutovs and SCTs tend to suffer from dewing. I was hoping I would get away without dew heaters as I really wanted the smallest and lightest payload to carry around with the least possible fuss. In due course the NexStar 4SE arrived. The packaging was immense, far larger than I would have imagined for such a small telescope but reassuring that with so much packaging the scope would survive almost anything the courier could do to it. Inside the three layers of outer packaging was a number of smaller boxes containing the OTA, the tripod, accessories and manuals. When unpackaged and assembled the telescope and its mount looked rather nice in the Celestron house colors of metallic orange. The orange by the way is a kind of burnt colour and not so garish as you may imagine from the advertising pictures. The telescope came with a standard red dot finder, 25mm Celestron E-Lux Plossl eyepiece, a lead for connecting the telescopes GoTo mount to a PC, some software for using the PC as a controller and a cable for remote triggering of a digital camera. A small bubble level plus a spanner that fits the tripod bolts was also included. The manual was supplied with a quick start guide and I found all the instructions relatively easy to follow. Set-up time from out of the box was probably around 40 minutes. By the way if you buy one of these telescopes make sure you keep the box that the OTA and GoTo mount head is packed in. Its a perfect foam cut out for the telescope and some after market cases require it if you want professional carry luggage. I had one small issue which was that the primary mirror when looking down the tube seemed to show a strange patina, almost like an oil film effect on the primary when it was placed under powerful tungsten lights. This worried me a bit as I wondered if the primary may have suffered some kind of coating damage in transit. A quick call to Steve at FLO reassured me. Apparently this effect is a result of one of the coating compounds and can show up under some types of light. Left: The Celestron Nexstar 4SE - its compact and simple. Overall impressions of the unit were very favorable. It uses a fair amount of plastic in its construction but the plastic is very high density and looks very rugged. The fit and finish was perfect, the focuser was a little light and lacking in feel for my own personal taste but it works well enough. The mirror flip control is firm and precise and both it and the focuser have substantial rubber grips. The OTA is surprisingly heavy for its small size and it feels like quality gear. T-adapter, the mirror flip control ( large knob to the left ) and the focuser ( knurled knob to the right ). Collimation out of the box appeared spot on. Just as well as these scopes are tough to collimate and usually require a factory return. This shouldn't happen if they are well cared for. The mirror flip lever is to move the built in prism so that you can either use the right angled viewfinder for observing or move the built-in prism out of the way and attach a camera via T connector to the rear of the telescope effectively converting it into a 1350mm lens for astro photography. The red dot finder is a typical low cost unit but well made and perfectly usable. I prefer them in fact to finder scopes myself and on a small scope like the 4SE they are perfectly adequate and much better for beginners to the hobby. The sturdy steel legged tripod mount has a built in wedge facility underneath the main head unit which holds the telescope which would be useful for astro-photography although this is outside of my own experience. I tested out the GoTo mount in the house and found the motors were relatively quiet and slew at a pretty quick rate. All of the instructions regarding the GoTo setup were pretty simple and within about 20 minutes of reading and playing around I had alignment using the SkyAlign process ( SkyAlign is a fully automated set up process that allows you to orientate the telescope using just three bright stars to set-up). Something I deduced from playing around with SkyAlign is that you MUST use the red dot finder to locate the stars and not the telescope itself. I suspect that this is because the SkyAlign software is based around naked eye objects. This is perfectly reasonable. The only nuisance factor with set-up I found is that the unit doesn't keep your time and date settings. A minor problem but the system would have been so much better with some kind of battery backed memory. I had been advised that although the 4SE mount has a battery compartment for 8x AA batteries its GoTo system is usually erratic with battery power also that it will not function well on rechargeable batteries. I like to test things for myself so on this score so I tried a set of new high power rechargeable of 2650maH and found that they worked tolerably well over an hour or so of use with the scope slewing and using its GoTo capability. No problems were encountered doing this but I would imagine from past experience battery life would be quite short especially when the batteries are exposed to cold weather. The GoTo system on the Nexstar is simplicity itself. You can either pick some named stars or use 'SkyAlign' which will align the scope using three bright stars. Its simple enough to set-up and one of the nice touches is that the hand controller will give you some details about the object by pressing the information key. The data held on the system is amazing for its cost and the object database contains 40,000 objects. Its worth noting though that a small Nexstar like the 4SE will not have powerful enough optics to see all of these. Indeed some would tax a very much larger telescope. As ever when I get a new telescope I learn its functions as well as I can in a well lit room, then I play around with it in a darkened room to get myself familiar with all of the issues of setting it up in pitch black. I find this pays dividends for a telescopes first time out under the canopy of a dark sky. This is especially true of GoTo systems, its a good idea to familiarize yourself with the menus and operation - it prevents frustration in a dark field or garden. After owning the telescope for a week or so I finally got a break in the weather and a free night. The weather tuned very cold and I knew I would have stable seeing conditions. Unfortunately I couldn't travel as far as I would have liked to a truly dark sky site so I had to use a site which would produce only indifferent conditions. The scope was packed and transported in a single trip down the stairs of my flat and into the car. Along with telescope came a powertank ( I didn't want to test the AA batteries out under a dark sky on the scopes first use and introduce any potential additional problems ) and a box of Celestron standard Plossl eyepieces. Setup in the dark was relatively easy. Levelling the mount was simple enough using an external bubble level. The one supplied with the telescope is too small to be of any real use. Fitting the GoTo head unit with the telescope was simple enough if a little fiddly but the practice at home as ever paid dividends. Set-up time was probably less than 10 minutes. I then ran the scope through its SkyAlign procedure and surprisingly it failed twice  then I realised I hadn't set the date and time and after that it acquired alignment using three stars easily enough. I found on first use the scope was missing its targets by a few degrees but I was happy enough and decided not to bother to rerun the alignment software or to run the procedure for precise alignment. During the alignment process I took a few minutes out to test collimation with a star and found the scope would produce perfect airy disks thanks to good atmospheric conditions. Unfortunately light pollution although more limited than where I live was very noticeable. design means no collimation headaches. First up was the Andromeda galaxy - my partner wanted to see Andromeda and its an easy enough target so I punched in the item on the tour menu and the scope slewed across the sky effortlessly and missed Andromeda by a whisker. The Galaxy showed through the 25mm EP as a faint smudge as I would have expected in a scope of this size under average skies. After having had a good look at Andromeda we moved on. 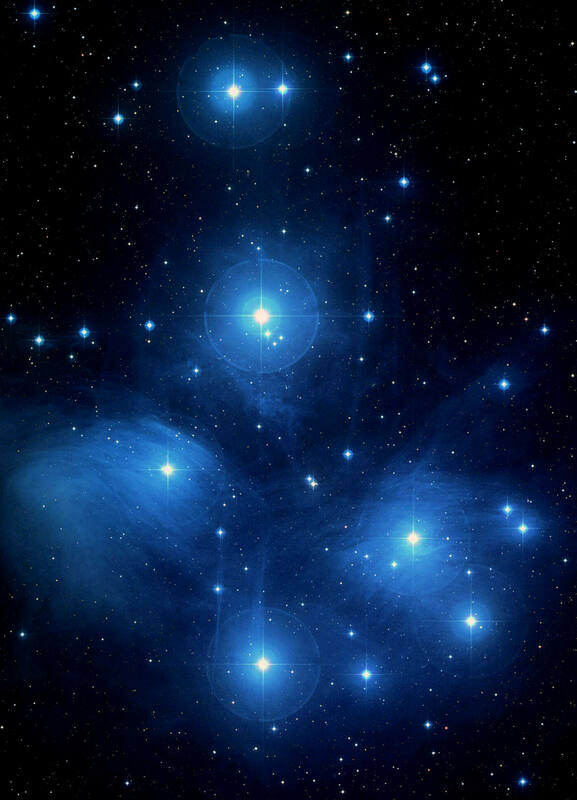 We took a look at a few clusters and the obvious choice of The Pleiades. Most were too large for the field of view of the 25mm EP and it was then I realised I had left the 32mm EP back at home attached to the SW 200  Doh !!! Personally I suspect even the 32mm may be too limited and perhaps a 40mm may be required to get wide enough views for larger objects. I then had the GoTo slew us around to look at Albeiro and we could clearly see the double with the golden star complimented by its blue companion. Contrast was not as good as I may have hoped but I suspect this was more to do with the light pollution than any inherent defects in the telescope. At this point the powertank started to run low  it had been in use for quite some time at home for the previous week and the cold was starting to bite. We decided on having a go for Neptune which was low in the sky but theoretically available. Unfortunately when the GoTo slewed to the position we found a large tree in our line of sight. Unfazed I called up Uranus on the GoTo controller and the scope moved enough to get a view past the tree. It required a little hunting down as the distant planets appear pretty much as dull stars and the GoTo was off by a noticeable margin. By experimenting with a 10mm EP I was able to centre up on the prime suspect in the EP and confirm it was indeed Uranus. This was quite a nice end to the evening as I have never directly observed it before. It showed up as expected as a pale blue disk of light. With the powertank running low and my hands frozen we packed up the telescope and plodded back to the car. Very happy overall and I think I will grow to like this piece of equipment. The GoTo was slightly off but I am sure this was due to some fairly rough and ready alignment and levelling. Running a precise GoTo fix I am sure would have generated better results. The scope was off by a consistent amount each time suggesting that perhaps our time data was slightly wrong. Tracking over the limited time the scope was locked onto each target seemed fine further reinforcing my view that errors in the GoTo were most likely induced by a sloppy set-up. The scope performed very well over the course of perhaps 90-120 minutes actual use and I am sure with a bit of perseverance and having the wider angle EP it would produce the visual goodies. The views of course are never going to equal the Sky-Watcher 200 which by virtue of its larger aperture and faster F ratio is more suited to deep sky targets but I feel the NexStar was a good buy as a grab and go unit which was the initial requirement. The optics seemed perfectly good to me for its small size. Under a less light polluted environment I am sure it would return better views and based on the first nights viewing I am sure against targets more suited to its design it will excel. Ill add some more reviews of it when I get a chance to use it on some more varied targets. For me Its a perfect complement to the larger scope offering near instant set-up and reasonable views given its tiny size. Well worth the money. I thought I'd write a review one year on with the Nexstar 4SE. After all during a first light review theres a natural 'buzz' to the product which a year later is missing allowing possibly a more objective view of the product. Last week the Nexstar 4SE was dragged out from under the bed and used yet again. During its tenure as my 2nd scope and my grab and go device its been used rather little. In fact the 8" Sky-Watcher has seen more use. At the Salisbury Star Party in August 2009 I had the Nexstar with me but for some reason the alignment process kept failing. I have no idea why but I suspected the software was defective in some way. The cold can affect these devices and Salisbury WAS cold. I never investigated at the star party in August because the sky was suffering clouds and I wanted time to use the 8". The Nexstar 4SE just sat there mournfully and got coated with dew. Last week the scope was dragged out and I gave it the treat of a software update from Celestrons web site. The Celestron software update system is tough to find on Celestrons site and completely lacking in the manual supplied with the scope but I eventually got there. Software updating for one of these things is a torturous process I found and takes ages. None the less once updated I determined to test the scope out again at the first opportunity. Now I should say at this point that the 4SE has been used quite a few times and before the star party bash it had always acquired a fairly accurate alignment. So last week the scope was taken to a dark(ish) sky site and set up for a nights viewing. Initially the scope proved a pain to work with even after the software upgrade. The power lead tended to keep dropping power despite me having opened up the DC power centre pin on the scope. For those not in the know the Nexstar series all seem to have a problem with the centre pin on their power jack. Its too narrow for many 2.1mm jacks and as a consequence reliable power can be a problem unless you use a small jewellers screwdriver to open out the centre pin. This had been done but the 4SE still gypped up. The fault was eventually traced to a faulty jack plug. Sorry Celestron wasnt your fault after all. After the flakey power was resolved the Nexstar hit alignment first time every time and both located objects easily and showed very little in the way of tracking errors. One thing that has been evident in using the scope is that The Skyscan software can report objects as visible when in fact they are below the horizon. Its not a big deal but it is a bit of a niggle at times. Tracking was accurate enough that when M42 disappeared behind a cloud and I decided to warm up in the car for 20 minutes when I came back out and the cloud had pushed off M42 was still pretty close to centred. The accuracy of the GoTo system being reestablisd after a software reload reinforced my view that the scopes original software had become corrupted. Possibly through cold or perhaps just from a software error. Most targets fell into the view of a 40mm Plossl EP and a 25mm Plossl both were in use. 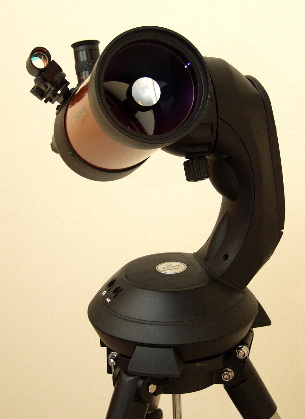 I have seen a review of the Nexstar castigating its inability to find objects and its wobbly mount. I can only report as I find. Apart from the SSP bash the Nexstar has always been as good as gold. Its alignment routines have worked perfectly (if a little slowly due to its relatively slow slew speed - slow compared to a tuned up HEQ5 that is). Tracking has usually been very reliable and the solidity of the mount adequate. Its worth remembering the Nexstar 4SE is a small cheap telescope and not Hubble. To summarise, the Nexstar 4SE is notorious for power issues. I have found in a year of owning it that so long as the centre pin on the power connector is opened up there are seldom problems. Most problems I suspect stem from poor power leads. GoTo capability is perfectly adequate for a small scope and tracking is likewise acceptable. GoTo using the SkyAlign automatic alignment on three bright stars does need to be carefully set up. If it is done accurately I have found the Nexstar always finds it target object. I have read on some reviews online where people moan about the Nexstar for its poor quality views. I find this strange and can only imagine that people are expecting too much from a 4" Maksutov with a long focal length. The design of the Nexstar makes it (like most Maksutov telescopes) very much a planetary and bright object instrument. I have always found the 4SE to be rather good at planets, doubles and bright objects generally. Its not a good performer on DSOs but then small scopes seldom are. I have viewed the Moon with the 4SE and found it to be good, it makes Albireo beautiful with clear colour and sharp views and generally provides good views of Jupiter and Saturn. Uranus and Neptune look like tiny blue disks which is all most telescopes can see of them. M42 looks good in the scope with a 25mm Plossl. M45 and many open clusters need a wide angle EP of around 40mm and even that proves too narrow at times. I have noticed a marked disposition with wide angle Plossls when used with this scope to easily create the dreaded kidney bean effect. I cant say whether this is a problem bought on because of the Maks narrow field and high F-number. I suspect that this is so as the 4SE has a marked disposition towards this effect with eyepieces that are better behaved in my 8" reflector. One of my small issues with the 4SE is the lack of 'feel' in the focuser. I reported on this when I first reviewed the scope over 12 months ago and its the one thing I really dislike with the scope. With that said I have tried out a few other small Maks and found them all pretty much the same in this regard. Including a Vixen equivalent which is a good deal more expensive. Over 12 months the Nexstar 4SE has been used less than I would have hoped. That's not a reflection however on its capabilities. It renders planets and the moon as well as any comparable product and double stars can look very good with it with very good color and sharpness. Its GoTo accuracy is perfectly acceptable and works well if a little slowly at times. Would I still buy it today if I were buying again ? I think if my needs were the same then yes. For a small Grab and Go scope its worthy of consideration. Since I bought the Nexstar 4SE other scopes in the same price bracket have come along. The new SkyWatcher Alt-Az GoTo scopes for instance with the Sky-Max 127 offering a full 5" of aperture against the Celestrons 4". If I were buying now Id look at the Skymax 127 on a GoTo as its more or less the same price. To balance that off the Celestron SkyAlign software has some definite advantages over the SkyWatcher equivalent especially for beginners and those wishing to just dabble. The Celestron is a nice scope and has a slightly more stylish look about it. Theres something about that orange tube which calls deeply to some of us. Its a little bit of history perhaps. OK its not a C8 but it still has a certain style which some of its rivals lack. Overall a competent package. Buy with your eyes open that you are not buying a piece of Palomar or Hubble but if you need a small portable scope with a dose of simplicity and flair you could do worse than the Nexstar 4SE.